Karch Kiraly Greatest Player Ever? 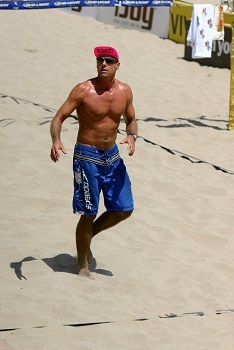 Karch Kiraly is considered the Michael Jordan of Pro Beach Volleyball. Kiraly has earned more than three million dollars playing beach volleyball and is the 'winningest' player in the history of beach volleyball. He has finished lower than ninth place only four times and has been in the semifinals over 80% of the time. Kiraly was taught how to play volleyball at six years old from his father, Laazio, a former Hungarian Junior National Team player. Kiraly graduated from high school third in his class with a 3.96 grade-point average. In 1992, Kiraly had his jersey retired at UCLA after an All-American volleyball career. While at UCLA, he led his team to three NCAA Championships (1979, 1981 and 1982) and earned All-American honors all four years. The Bruins compiled a 123-5 match record during the Kiraly era, with two undefeated seasons (1979 and 1982). Kiraly was the youngest player on the USA Gold Medal-winning team in Los Angeles in 1984. In 2001, Kiraly was inducted into the Volleyball Hall of Fame. Kiraly is an accomplished author, and contributing editor to several volleyball publications. Kiraly has worn a pink hat during every competition since 1992; calling it, "tradition". Kiraly was named as the Greatest Male Volleyball Player of the 20th Century by the FIVB. In high school, in 1978, Kiraly lead his Santa Barbara High School volleyball team to an undefeated season. Kiraly went on to UCLA where he graduated in June of 1983 with a 3.34 GPA in Bio-Chemistry. FIVB, the international governing body, named Kiraly the "Greatest Player of the 20th Century"
Three-time Olympic gold medalist (1984, 1988 indoor champion; 1996 beach champion). Named by FIVB as the Best Male Volleyball Player in the World in 1986 and 1988. Kiraly holds the record in beach volleyball history with 148 career wins breaking the all-time mark of 139. Kiraly was the first volleyball player ever to make $3 million in beach volleyball prize money. While at UCLA, Karch Kiraly led his teams to three NCAA Men's Volleyball Championships while being named to the NCAA Men's All-American team four times. AVP Best Defensive Player (2002). AVP Best Offensive Player (1990, 1993, 1994). AVP Comeback Player of the Year (1997). AVP Most Valuable Player (1990, 1992, 1993, 1994, 1995, 1998). AVP Sportsman of the Year (1995, 1997, 1998). FIVB "Best Player in the World" 1986 and 1988. Inducted into the 2005 AVCA Hall of Fame Class.